We need your help to make the Lions Splash Pad a reality. We need your help. Donors will be recognized with personalized bricks. Donations can be mailed to Scotia-Glenville Lions, PO Box 2001, Scotia, NY 12302. Online donations can be made here. 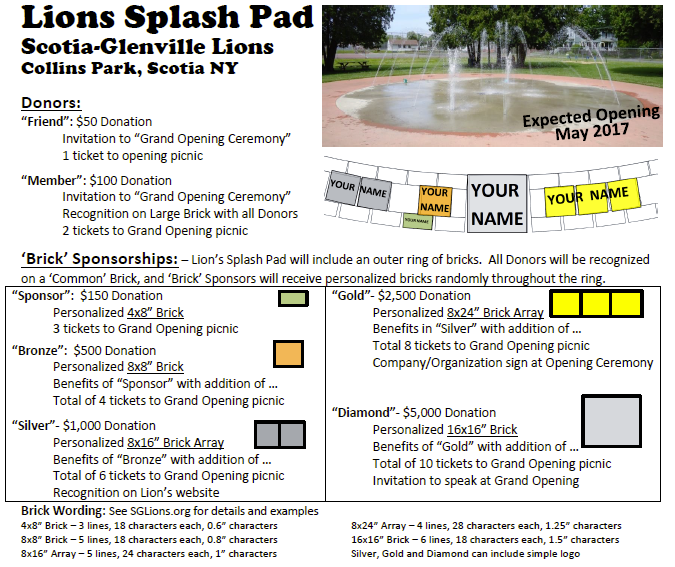 The Scotia-Glenville Lions are a 501(c)3 non-profit organizations. The Scotia-Glenville Lions are part of the GE Foundation Matching Gifts Program. Any donation made by a GE employee or retiree will be matched 1:1 by General Electric. Donors will be recognized by the total amount of their donation (donor and GE contribution). Register donations at GE Foundation Matching Gifts Program using the following information: Organization Name: Scotia-Glenville Lions Club, Inc or Tax ID: 14-6035589. Make a comment about GE Matching in the notes section when donating. A personalized 4×8″ bricks start with the “Sponsor” level with a $150 donation or a $75 donation with GE matching.